Before I begin. this is not a sponsored post and the brands mentioned here have nothing to do with my post. This is my personal experience. A decade and a half of living with Acne and trying all means to combat the same, I had come to a point of acceptance. This acceptance was like defeat. I have been to the best dermacosmetologists, spent money on the best peeling treatments. I even had the best skin ever phase but the moment I stopped those peels, the whole acne thing came rushing back. Thankfully not as severe as it started when I was in 9th grade but this time in a muted way. On an average 5-6 acne on my face at any given time . Add to that all the spots that are memories of battles lost . 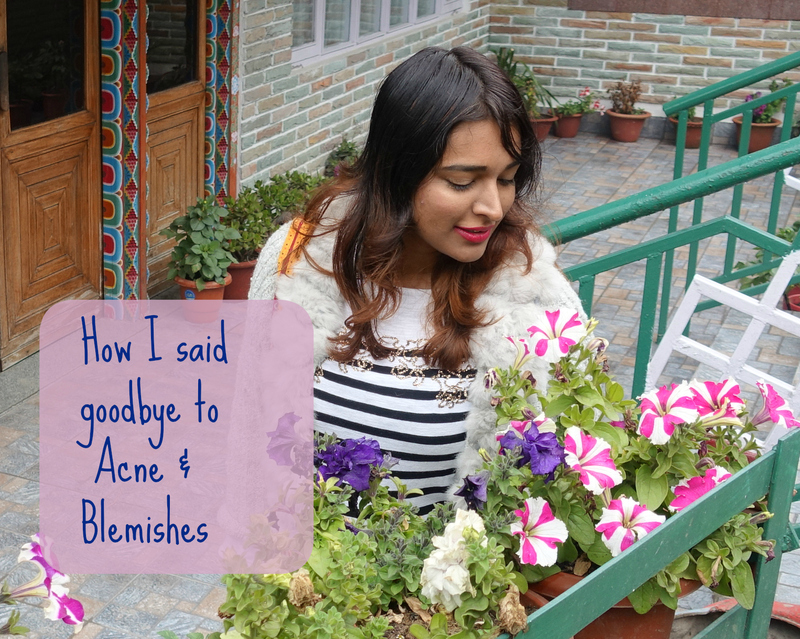 From the last 2 years, I have been relying majorly on BB-CC creams to help the blemish story- my favourite being the Bourjois CC cream . I have also come across some very effective skincare products like the Herbalife Skin about which I blogged, though its a very expensive deal to be regular with . If you want to know about it read here- . It was in Sep 2016 that I was back to Mumbai from a trip to Croatia. 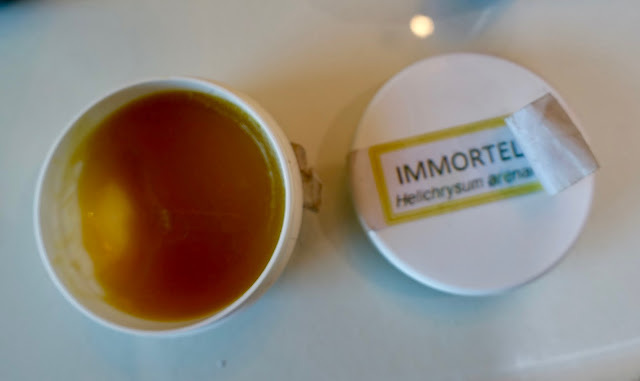 I met this old man at a vegetable market in Dubrovnik who was passionately selling some balm called Immortelle to get rid of blemishes made by his daughter- All natural. I spent 700 on it , I don't know why I felt I should trust that man. Then later back home, I met my blogger friend Shayoni from Sweet and bitter who is diligent with her skincare regime . I have had the skincare over makeup ideology but when numerous attempts fail and acne comes back, its disheartening. I suddenly felt a strong skincare calling- this time with another set of products. In the meanwhile, the Croatia product amazed me. It turned out to be more effective than I had imagined. It helped to lighten blemishes and made the skin tone even and I was afraid I wouldn't get it anymore. 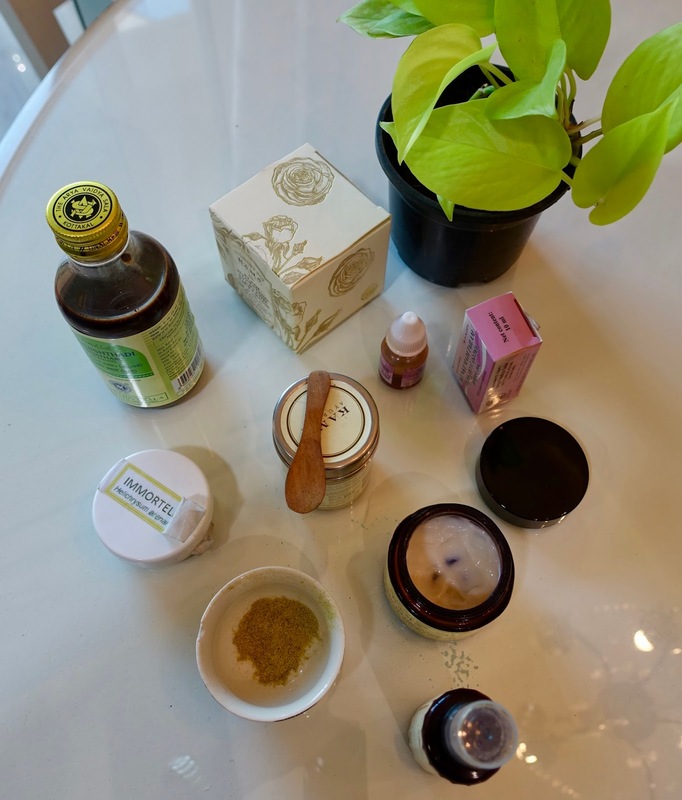 I had to explore alternates .Thanks to my school best friend who is an Ayurvedic doctor , I took recommendations on what will suit my skin in terms of skincare products and medicines . My plan was ready . I just wanted to use organic and natural products, not chemical. In 2 weeks after I decided, I fell sick with dengue and was crossing my fingers that I escape live from the dreadful sickness and yes , I write to claim my existence. It brought a shift in my eating patterns drastically. If it wasn't for my mom, I wouldn't have had the luxury of a fruit plate for breakfast every morning with a glass of sweet lime juice. So here goes my regime. Skincare isn't just about what products you use on your skin but about what you eat. This breakfast has definitely helped my skin. No cooked food to start the day but a bowl of watermelon/ 1 banana/ an apple and a glass of sweet lime or orange juice. Its a lot of fruit on the table but helps you kick start the day with fresh energy. And now here comes the topical skincare part. 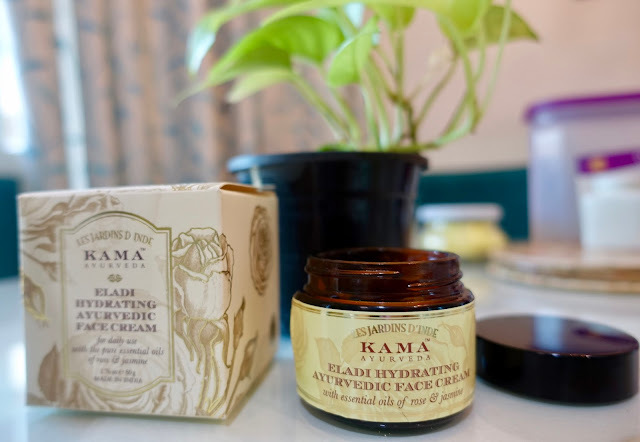 Kama Eladi face cream ,first thing after my bath. 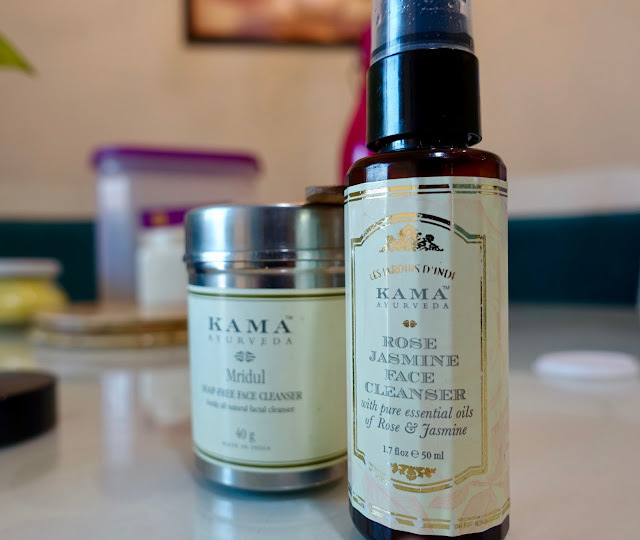 The cleanser has worked wonders as its a natural mix of several herbs. Don't expect lather as it has no chemicals. Once you've had your bath, hydrate your face in the next 5 minutes or it dries the skin. I got introduced to Eladi face cream through a sample I got at Kama store . It has become my go-to since then. Also I showed contents to my Ayurveda doctor friend and she approved. Its been since October that I am using it daily and it has finally reached the bottom of the bottle. The cream is non-oily and so hydrating- it instantly makes my face bright. You wont believe but I have stopped using CC cream on top of face cream. I have been only wearing this face cream even to parties since then. The Rose & jasmine cleanser is another mild cleanser that works well on my skin with a little lather . Its best to use after a day’s work to remove makeup and dirt. 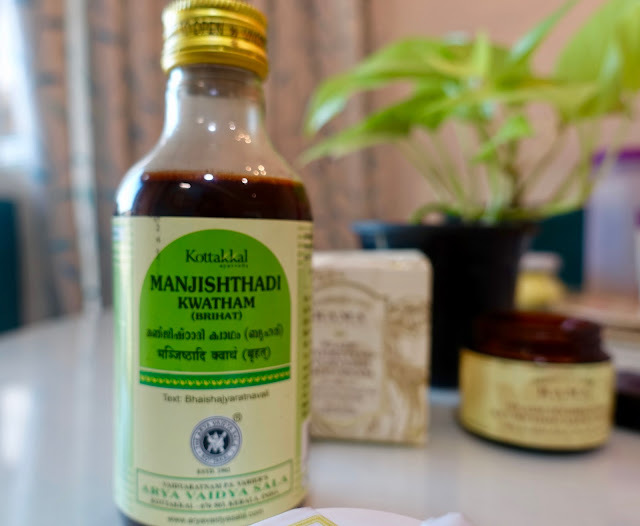 overly priced and I found genuine reviews for the Kottakal product which is 1/6th the price. Kottakal Ayurvedshala is an organisation making Ayurveda products from a century and again my Ayurveda doctor friend approved of the ingredients , so I had to buy this. Indeed, this tail turned out to be magic. If I have to name one product in my life, that was life-changing - It is this. Since November, I have used it regularly and I just bought my second bottle at 360Rs for 10ml. I use 3-4 drops after my before-sleep face wash .I rub it gently all over my face. On active acne , I apply a little more. The next day, acne seems to mellow down and goes away eventually. No drying. This tail has substantially helped lighten the blemishes and reduce the pores. You can use it on your lips if they are pigmented. It works so well. To find Kottakal products, just google in your city. They have tiny shops where they retail only Kottakal products , its a huge network . If you don't find one, Amazon has listings too. My Ayurvedic doc friend prescribed this Kaadha. 2 bottles to be taken in 15 + 15 days as one course. Now, I wouldn't recommend you to take this without an Ayurvedic doctor’s consultation. This Kadha is the worst tasting thing I have had in my entire life. So finishing 1 bottle was my biggest achievement. I’ve finally bought my 2nd bottle. I was unfortunately not regular with this ,but the 15 days that I took the first bottle I was amazed. My skin has definitely benefitted from the miraculous formulation. If your doctor agrees, please have it without a second thought. This again was Kottakal Ayurvedshala formulation. There are other Ayurveda houses that make this too. But trust Kottakal blindly. Today, I don't know what I would do without Ayurveda. It has become a way of life. If you have the oily combination skin like mine, you may benefit from then regime above. This is the secret to my current skin and I am really happy with this. Discipline is essential with skincare and health. There is no way one should escape that. All the best girls . I wish you a lovely skin ! Congratulations on finding the regime that suits you the best and thanks for sharing it with us. 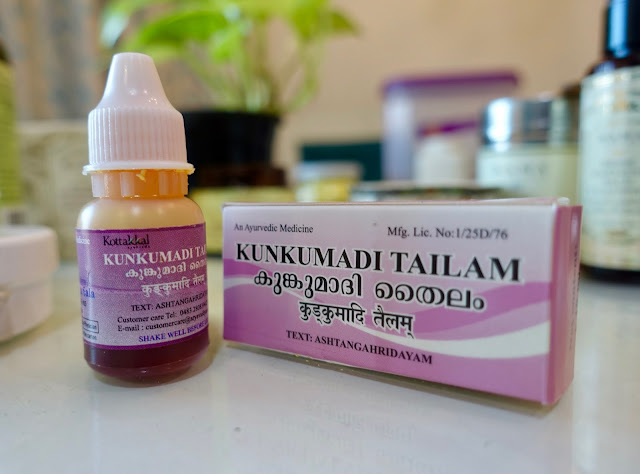 Wanted to ask where did you buy the Kottakkal Ayurvedshala Kumkumadi Tailam in Mumbai? Thanks again. Hey Aditi . Yay I'm glad �� I bought mine from Andheri East , opp JB Nagar post office . If you google Kottakal arya vaidyashala you'll find one near where ever you stay . Just call their number before you visit! Let me know how it goes for you . yay!! finally i bought my kumkumadi tailam and its my second day of use. I got 1-2 small boils over my face.but thats ok... i shall continue to apply for atleast 2 weeks and see the difference. CYA!! Great! Just use 3 drops for entire face . On boils you an apply separately but not more than a drop . It'll work wonders . Loved the blog!! Looking forward to try out these things!